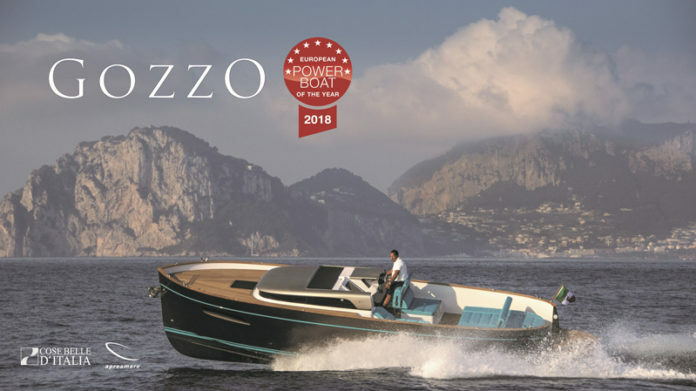 Gozzo by Apreamare unanimously won the prize in the motor category between 25 and 35 feet during the exclusive Flagship Night which took place on Saturday 20 January at the Congress Center in Dusseldorf, at the end of the first day of the biggest boat show indoor in the world, BOOT 2018, and in the presence of the whole of the nautical world. The new Gozzo has won for masterfully reinterpreting the ultra-centenarian tradition of the Sorrento Gozzo, enriching it with innovation, performance, comfort and technology while maintaining the charm of the original lines even if revisited in an absolutely contemporary key. Gozzo is the result of a vision of Cataldo Aprea, developed by the designer Brunello Acampora of Victory Design and made by Imbarcazioni d’Italia – a company belonging to Cose Belle d’Italia group. Gozzo is an 11-meter planning boat (registered as a <10 m vessel) with a variable geometry hull with 16° deadrise able to reach 31 knots of maximum speed with a range of over 200 miles at cruising speed. The deck presents the classic liveability of the Sorrento Gozzo and of the Mediterranean boats with a large convertible sundeck, chaise-longue, seats, table and shaded areas. In the below deck there are 2 cabins, an equipped kitchen and a bathroom with a separate shower. Great emotion and satisfaction on the part of Cataldo Aprea who collected the award together with the designer Brunello Acampora and declared: “I am honoured to receive such a prestigious award in the international nautical scene. Gozzo is the synthesis of years of ideas, projects and visions lived with passion and dedication together with the whole Apreamare team. And to know that the jury is composed of the Directors of the most authoritative European nautical magazines is the confirmation that we have taken the right way for Apreamare”.